Six years after the groundbreaking appearance of The Mathematical Theory of Communication, elaborated by Claude Shannon and with an explanatory essay by Warren Weaver, another Weaver piece appeared in Machine Translation of Languages (1955). This collection of essays extended the theories of linguistic mechanization that Shannon’s work implied. As an electrical engineer trained in formal logic, Shannon’s engineering papers on the manipulation of electrical signals as substitutes for logical processes had begun emerging in the late 1930s. Weaver, the American chair of the Applied Mathematics Panel during World War II, worked to popularize and spread Shannon’s work across a wide range of technical and scientific fields through what was, in many ways, an act of disciplinary translation. Weaver’s role in Mathematical Theory was to elaborate in prose the mathematical stakes of Shannon’s formulations for informational entropy, a new idea that was, itself, a translation of equations drawn from the study of thermodynamics. Only six years later, machine translation had been granted a dedicated research chair at M.I.T., had found a wide range of implementations across the country, had provoked a similar program in the Soviet Union, and had received a high level of defense funding that only continued to increase.2 Owing to the rapidity of the rise, the editors of Machine Translation of Languages felt it appropriate to include an “Historical Introduction” that described the last few years of the project. Weaver’s introduction characterized the papers in the volume as representing a whole new research orientation and episteme with a mythic resonance: “Students of languages and of the structures of languages, the logicians who design computers, the electronic engineers who build and run them…are now engaged in erecting a new Tower of Anti-Babel,” he proclaims. The logic of this tower figure begs the question: what is the new “anti-” Babel “against” in its renewed incarnation? Machine translation’s Anti-Babel, Weaver explains, must “build part of the way back to that mythical situation of simplicity and power when men could communicate freely together, and when this contributed so notably to their effectiveness.”3 Yet as he describes how this new tower is “aimed” in a beneficent direction, Weaver betrays not only the military unconscious behind his metaphor but also a philosophy of language whose enemy was linguistic plurality. Even as it seemed to facilitate the pre-existing multiplicity of earth’s languages, postwar machine translation proceeded from the view that linguistic traits of incommensurability, ambiguity, figurality, idiom, and opacity were so much noise occluding the simplicity and power language could otherwise embody. Drawing on Peter Galison’s theorization of World War II cybernetic technologies as designed around an “ontology of the enemy,” I suggest that machine translation, from its earliest days, is predicated on an ontology of enemy language.4 In this ontology, not only is enemy language the language spoken by a group deemed an enemy. Even further, language itself is attributed subversive, enemy traits in its “resisting” decryption, defying grammatical law, and hiding its intuitive patterns in plain view. Excited by Weaver’s promise of “simplicity and power” in communication, the U.S. government spent $20 million to fund MT projects at seventeen different institutions between 1956 and 1965. This new ambition to use computation to construct an operable linguistic plurality satisfied political and economic demands to replace the unpredictability of human translation with a process freed of the mess of equivocation, ambiguous terms and undecidable contexts. Within this early machine translation era, an overwhelming ethos of interdisciplinary transformation was afoot, as methodologies from technical, mathematical, behavioral, and linguistic sciences all converged, coordinating previously disparate aims toward concrete projects of Cold War technology. Meanwhile, this era resulted in profound epistemic reconfigurations of the theory of language itself, reterritorializing not the “essence” of language so much as the status of linguistic difference: from socio-cultural field to mathematical, informational quantum. If language seems a different sort of entity to us now in the age of Google Translate, a reconstruction of the technological genealogy for this transformation will show us how this period’s attention to the registration, quantification, and eventual commodification of language recast an ungovernable field of difference into an operable systematicity. From differences to differentials, new theories bent language toward the navigable, the productive, and the predictive. Machine translation programs of today use complex statistical modelling and (most recently) deep-learning algorithms self-training on online human translated linguistic corpora. Yet while Weaver’s 1955 introductory essay alluded to Wolfgang von Kempelen’s eighteenth-century chess-playing automaton – revenant trope in the techno-imaginary of Western modernity – it also placed this revenant alongside the ancient figure of the Tower of Babel so as to articulate its project of universal translation. The dream connecting Weaver’s Anti-Babel of linguistic simplicity with a chess-playing automaton is one where translation and calculation converge: moving from multiplicity to simplicity, from plurality to power. This was in keeping with larger goals of a majority of Cold War technological innovations to fix or secure desired outcomes, and to do so, paradoxically, by forecasting outcomes: to determine by determining. These tautological forms of modelling-as-control had their apotheosis in postwar game theory, when governing via the politics of containment and intervention made such forecasts into fundamental acts of statecraft. Our latest technologies profit from precisely these forms of statistical mathematics that made game-theoretical risk assessment at a global scale possible. 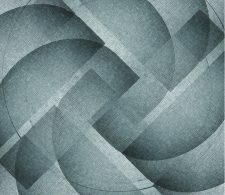 In the context of the argument that follows, I will be concerned with the ways in which language is retheorized as code, translation as decryption, and linguistic difference as subvertable through metalanguages (or what we might call “hypo-languages,” symbol-processing systems that are evolved or manufactured to subtend “natural” language). My interest lies in the formation of an epistemē devoted to the computational management of linguistic difference that also leads to the computational “generation” of “natural language” (NLG). Significantly, this endeavor to teach computers how to calculate or “reckon” with language also takes the literary threshold of poetic form as its horizon, the final frontier for its Anti-Babel. Creating the machinic, computational ability to translate was a primordial step in the process of developing machines with the ability to generate language on their own. In the history of computing, translating came before speaking. Technical innovations in engineering machine translation were intimately linked to pursuits of machine cognition, more generally. While translation, for these engineers, lay at the beginning of language and thought, it must not be forgotten that machinic translation was viewed within the larger (mathematical) paradigm of encryption. Perhaps it is this historical kernel of the cryptic or enigmatic signifier that led technicians to their noteworthy choice of heuristic for measuring technological progress in symbol-processing machines: their predecessor enigma, the poem. “In language there are only differences without any positive terms,” Saussure has maintained; but will this give us a calculus of differentials? Is there a grid on which lexical infinitesimals can parse not only a memo from a chair of Applied Mathematics, but even Mallarmé’s poetic-noetic flower, “l’absente de tout bouquet”? Yet this AI challenge and these accomplishments have not ceased to proliferate further experimentation. What is being sought in ever more advanced poetic algorithms? An algorithm that can merely generate poems seems insufficient ­– instead, the automatic generation of language is being pursued beyond the point where we can recognize “its” voice, toward the point where we might recognize it as if our own. While these forms of deconstructed authorialism connect to the much-needed critiques of Enlightenment subjectivity instituted by Lacan, Barthes, Foucault and others, it is worth considering the extent to which the postwar avant-garde imagination was influenced, in its practices, by the promise of the computer as language-generator. Theorists and engineers of the computer, on the other hand, seem quite enamored of the chance to revive the viability of Enlightenment rationality, albeit outsourced in their machines. Wiener sought to displace human communication onto ever larger fields of communicative transitivity. In the cybernetic ontology of message and receiver, the notion of complex yet computable communicative transactions – between organism and environment – structured every relation from the cellular to the social, from the broadcast news all the way down to the neural apparatus. “Cybernetics thus stages for us a nonmodern ontology in which people and things are not so different after all,” Andrew Pickering later infers in his laudatory reading of this scientific movement.43 Pickering contextualizes cybernetics as designed beside and against the (humanistic) academy’s postwar linguistic turn, depicting cybernetics as heroically struggling to emerge “in a world where epistemology was the thing, and ontology talk was verboten.”44 While Pickering believes that “the history of cybernetics might help us imagine a future different from the grim visions of today,” it is important to note that Pickering’s optimism comes from his alignment with cybernetics’ generalized attempts to delete representational detours and get to the things themselves: in other words, cybernetics’s information-theoretical project to reconceive language as operable code, as translation as a form of encryption. In this cybernetic view of the organism as information processor, the strength of “biological computing was that it was immediately performative, involving no detours through the space of representation.”45 What stands most clearly as obstacle in the path toward an ontology engineered by cybernetics is the problem of language as something other than computable. The alleged “problem” to which McCarthy referred lay in finding or inventing a uniform, infinitely extensible language for perceptible, cognizable reality: an existential monolingualism. The problem was posed not by the power of nature, but by the language of nature – that is, the language of nature conceived as code.55 Here, cryptological convictions beneath this monolinguistic ideology reappeared: “Nature offers resistance to decoding,” Wiener admitted, “but it does not show ingenuity in finding new and undecipherable methods for jamming our communication with the outer world.”56 The tendency of the nonhuman world toward what we might call a perverse polylingualism represented for Wiener the “passive resistance of nature.” This nature resisted, but not ingeniously. Mechanically? Nature seemed almost an automaton… but not a cyborg. Nature seemed to originate in technology’s first age, an age that, for information theorists, was characterized by wasteful transfers of data, ruinous translation between organism and environment where, Wiener continued, an “act of translation [is] capable of dissipating information… dissipated but not gained…the cybernetic form of the second law of thermodynamics.”57 When one subjects language as such to the rules of entropy (as Claude Shannon did for vocal sound and writing systems), one misses the fact that, whenever linguistic translation occurs – whether it’s judged to be inaccurate or attains the upper limits of fidelity – in all cases, something else comes into being. Literary translation sutures, only momentarily, two systems of ordering the world (languages); any claims to commensurability are tempered by a total rejection of assimilation – the data sets cannot be merged. For this reason, its helpless events of “impurity” produce new meaning, not no meaning. The problem of “translation” described by its machine-theorists is in fact the problem of a philosophy of transcription and transitivity trying to pass itself off as translation. In the case of MT, there are always at least three “codes” – two linguistic, and one machinic. Thus, while in linguistic translation, one language does something “beside” another, in transcription, one language does something to another. The machinic language “renders” the source and the target; but the transfer is not without residue. Some residue of technical parametrization is left behind. “A mechanical translator, like the sorcerer’s apprentice, is unable to desist,” early MT theorists Richens and Booth admitted with chagrin. “It will continue to translate even when not required, as for example, when it encounters proper names… the readers must be prepared for Tours to come out as turn/tower (plural) and for Mr. Kondo to appear as Mr. near-wistaria.”58 Here the Tours of the proper name that cannot stay a name, but can only be rendered into abstract concepts – towers, turns – might remind us of Babel itself, both city name and words-within-a-name: Ba-bel, or “city of god,” as Derrida pointed out.59 How can the machine be programmed to refrain from rendering such a unit? How will the machine know when the Tower is high enough? But is there an art that arises in such a scenario? Of the many poetic experiments that have emerged to mediate and confront the problem of linguistic generativity, I will focus on two that are now regarded as canonical examples in the so-called “prehistory of digital poetry,” but whose original intentions or successes were far from clear to their designers. The first is the work of Theo Lutz, producer of the first “stochastic poems.” The second is “Poetry Vending Machine,” by Hans Magnus Enzenberger, a treatise written in the 1970s in a spirit of “ennui” against radical politics. The work remained unpublished until 2000, at which time a municipal council offered to construct the machine outlined as a thought experiment in the treatise. Both these computational, language-generating projects operate within and on the concept of literature and the “poem.” But they leave us with more questions than they answer, especially when the literary tropes they would seem to transcend are read back against them. As the heirs of machine translation research, NLG continues to this day to pursue the limit of the poem. In a research article from 2015 we read that “A poem is generated by filling the grid, one element at a time. Each ﬁnal word is selected from its set of candidate words” through “a step-wise pruning of the whole lexicon by the reasoner, based on various constraints.”76 It would seem that little has changed since the early days of mechanical substitution in translation – though the programs are more elegant, the machines faster, the mathematics more complex… However, that which emerges from the newer experiments is akin to machine translation’s legendary “The vodka is good, but the meat is lousy.” [The alleged Soviet machine translation of the English phrase: The spirit is willing, but the flesh is weak.]. If our machines are now, or have always only been, capable of a Dada aesthetic, are we to ascribe to them the revolutionary motives Benjamin attributed to Dada’s originary proponents, whose “poems [were] ‘word-salad’” made from “every imaginable kind of linguistic refuse…a ruthless annihilation of the aura in every object they produced”?77 The key to the poetry-generating neo-Dada machine is what Benjamin pointed out about Dada 1.0: every object made was branded “a reproduction through the very means of its production.”78 The question is what is being reproduced – the fact of language or the fact of computation? Another, monumental experiment in the history of avant-garde automatic poetry is German poet and translator Hans Magnus Enzensberger’s Invitation to a Poemat. This short manifesto, written in a grimly farcical mood, imagines the construction of a machine-poet that Enzensberger did not intend ever to be constructed. In 1974, Enzensberger is already taking a retrospective view of previous computational text-machines, “well-educated cretins,” as he terms them.86 Enzensberger insists that real success can only come from a a “three-dimensional poem,” a textual artifact whose coherence goes beyond simple sentences. Critiquing grammar-programmed and ultimately boring text-producing algorithms, he points to the example of metaphor as lying already beyond grammaticality: “The House” + “sleeps” can be grammatical and poetic, while “The House” + “spoon-feeds” is grammatical yet hardly cogent, it is merely “anomalous.” Enzensberger states that while a rule-following, sentence-producing automaton is easy to build, the challenge is to construct one in where a “poetic secondary structure” modulates the outputs.87 Enzensberger puts it, “the production (and understanding) of poetic texts is subject to more than the basic rules of grammar.”88 Enzensberger’s Invitation to a Poemat,89 imagines building a poetry vending machine, an absurdity he uses to think through the existing limits of language-processing. The poemat, Enzenberger feels, is doomed: not simply because “no linguist” could program its language capacities, but also because “poetic competence is a special case of general language capacity.”90 As Enzensberger adduces a certain contradiction in the creation of a truly poetic vending machine, one that would endure the same contradictions as the human user of language: “While the logic of a simple text-generating machine aims for symmetry, grammaticality, redundancy, and monotone, a poemat must attempt a high level of variety, surprise, polysemy, and certain disobedience to rules.” This “secondary structure” of poematicity, he realized, would produce errors in the underlying, rule-based algorithm, such that “the outcome could only be a compromise, one that holds both sides of this dialectic in common.”91 While in 1974, these pronouncements seemed intuitive, by June 2000, the municipal council of Landsberg am Lech actually went about constructing Enzensberger’s poemat for a local poetry festival.92 Computer technology had advanced to the point where this “compromise” of which Enzensberger had written, a compromise between technicity and poeticity, seemed no longer insurmountable. For German mathematician and computer scientist Theo Lutz, earliest predecessor to Enzensberger’s more ironic auto-poetic machinations, the purpose of automating poetry focused on the simpler and more pragmatic question, “is it possible?” Canonized as one of the earliest writers of computer-generated poetry in C.T. Funkhauser’s Prehistoric Digital Poetry, Theo Lutz, in 1959, ran an algorithm on a Zuse Z22 computer at the Stuttgart Technische Hochscule that generated stochastic texts – pairs of short, declarative sentences. The program cycled randomly through a restricted repertoire: a set of 16 nouns and 16 predicates. In his write-up of the text-generating experiment, Lutz refers to the code-numbers given to each word as a form of “alphanumeric encryption” [alphanumerische Verschlüsselung] and describes his mechanisms for standardizing agreement between the “truth-values” [Wahrheitswert] of sentences.98 He extrapolates from the foundational ease of working with “unambiguous” [eindeutig] languages, “mathematical language,” to suggest that “with programmable digital computers arises now a synthetic philology, a philology that does not analyze a text but, rather, synthetically generates [synthetisch erzeugt] the text.”99 Lutz places no special emphasis on poetry or poetics in the various articles he published about his algorithm. 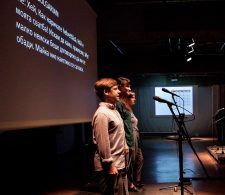 It seems the experiment has come to be spoken of as digital poetry simply because its first results were published in Augenblick, Max Bense’s journal for contemporary experimental poetics. EVERY STRANGER IS DISTANT. A DAY IS LATE. EVERY HOUSE IS DARK. AN EYE IS DEEP. NOT EVERY CASTLE IS OLD. EVERY DAY IS OLD. In The Castle, as in Lutz’s “stochastic texts,” the probable and the unpredictable overlap. In the narrative of Kafka’s The Castle, a land surveyor arrives at a remote castle only to find that his invitation to survey the baron’s estate is subject to inexplicable delays, technological mediations, and perplexing complications. Kafka’s land surveyor in The Castle adapts to a labyrinthine world in which bureaucratic procedures, sovereign fiat, and meaningless obstacles mutually entangle and thwart each other in nightmarish cycles of deferral. Lutz’s experiment, by randomly regenerating the lexical corpus of The Castle, intriguingly recapitulates not only the atmosphere of the novel (“late,” “stranger,” “old,” “distant,” “dark”) but also reinstates the historical and philosophical query behind Kafka’s textual project: does the “message” hold greater or lesser power in the age of information technology? Kafka’s novel, with its intricate network of telephone calls, form letters, official permits, and hearsay, depicts a ghostly symmetry between the modernized relic of the baronial Castle and the mythic return of the biblical Tower of Babel: its confusion now not simply of multiple languages and codes, but a crisis within informational integrity itself. Even as inscrutable and contradictory messages encircle and confound the land surveyor, this message-proliferation works to diminish any sense that meaningful plans stand behind them or that coherent agents have generated them. Indeed, Kafka’s The Castle is already a novel about the mechanization of message. Theo Lutz’s randomized Castle (1959), then, represents something more than ancestor for computer- poetry. It is also a technologically generated “answer” to Weaver’s Anti-Babel (1955). Weaver ceaselessly advocated for machine translation as crucial information-age milestone, hoping to leverage a computational theory of languages that “will build part of the way back to that mythical situation of simplicity and power” once possessed by some postulated utopia of prelapsarian monolingualism. Weaver, as spokesperson for language’s computational rewrite, presents the new (or renewed) imperative to reunite all forms of communication into one seamless, measurable, and readable flow of positivities. “Language” was to be replaced by signal processing; all inchoate domains of existence from which “information” could be extracted were to be filtered and standardized for universal computability. As if in ambivalent answer to this Anti-Babel, then, Lutz concocts a new, digital-age mode of lexical confounding that originates in or emanates from the abilities of computation itself. His Stochastic Texts proliferate, complicate, and disseminate Kafka’s The Castle, and these messages—stochastic, yet rule-bound—lead us neither toward a hermeneutics nor toward an intentional speaker. While the mechanization of Kafka’s novel through the “power and simplicity” of Lutz’s algorithm indeed heralds the dawn of computer-generated literature, if we lose ourselves amidst the festivities surrounding the much-celebrated death of the author we might miss attending to new predicaments for readers: located within a new forest of computer-generated texts that surround us, invite us, permit us, deceive us, and divide us. The Stochastic Texts of Lutz prophesy our now generalized condition in the age of search-engine optimized advertising, ad hoc fake news written by chatbots, and a constant, “benign” background registration of one’s every movement and habit: the “big data” of the infinitesimal and the intimate generated by our position within a technological scaffolding, “the internet of things.” The shadow cast by the Anti-Babel might in fact bear a passing resemblance to the silhouette of Kafka’s Castle. We share in the uncertainties faced by the land surveyor, K., suspended in an indeterminate space of messages that may or may not originate in an author, or a reliable intention; messages that may or may not revoke or permit life and work; accidental messages that the self’s own smallest actions may or may not – stochastically – set into motion. This background-space of messages in which we find ourselves enmeshed and produced, even as we help to produce it, enables new forms for intelligibility even as it risks disappearance, obsolescence, and loss of intelligibility. In a 2012 article on “The Future of Poetry,” Thomas Wolf meditates on the past and the future of language-generating algorithms and computer-generated literature, concluding that, “reduced to a simple machine output, poetry would be less like a form of human communication (assuming it ever were so), and more like a birdsong: something we find pleasant as it lilts along in the background.”102 By the parenthetical phrase “assuming it ever were so,” we are meant, it seems, to question whether poetry has ever been a form of communication: a valid query. Yet we might also turn this around: “assuming poetry ever was human,” an open question, in my view. I would suggest that the computational age with its machine-generated texts makes it easier than ever to see that poetry is less an intentional utterance than a nonhuman product of an immanent property of language itself. From the perspective of most computer scientists, the construction of the Anti-Babel is now nearly completed, as recent announcements concerning Google’s “neural-networked” machine translation successes make clear. Here we find ourselves in a new age of A.I. debates: what immanent properties will emerge from a vast machinic infrastructure built up around the totalizing dyad of “communication and control” as postwar computer scientists and cyberneticists first conceived the computational horizon defining “the animal and the machine”?103 We are asked to prepare ourselves for a poetry demoted to birdsong, “lilting along in the background.” But why, in such posthuman speculations on a poetic background, would humans be left, implicitly, in the foreground? From the perspective of the machines that collect and process the big-data of our daily communications, the question could be reframed: what background are human-generated linguistic acts composing in the process of their real-time accretion? What usable calculations does this background make possible? Are humans, in any meaningful way, in the foreground of these calculations? In our continuing meditations concerning the status the posthuman author, we should not miss an equally important window of opportunity to think through the unpredictable effects of seven-decades-worth of information-age decentering that expressly sought to alter not abstract “humanity” so much as the status of humanity’s languages – shifting the devices of language toward transmission, from intersubjectivity to operational transitivity, from plurality to encryption, and from irreducible multi-lingualism to the “interlingual” computational representations underlying the mathematical abilities of a new generation of machine translation: the next phase of crypto-monolingualism. This essay was written during a postdoctoral fellowship at the Penn Humanities Forum. I am grateful to all my colleagues in the Forum’s weekly workshop, who read and commented on earlier drafts. I am especially indebted to the guidance, insights, and generous conversation of James English, Michael Gordin, Judith Kaplan, Laura Kunreuther, Rahul Mukherjee, Sheila Murnaghan, and Christine Poggi. Article: Author does not grant a Creative Commons License as part of this Agreement.